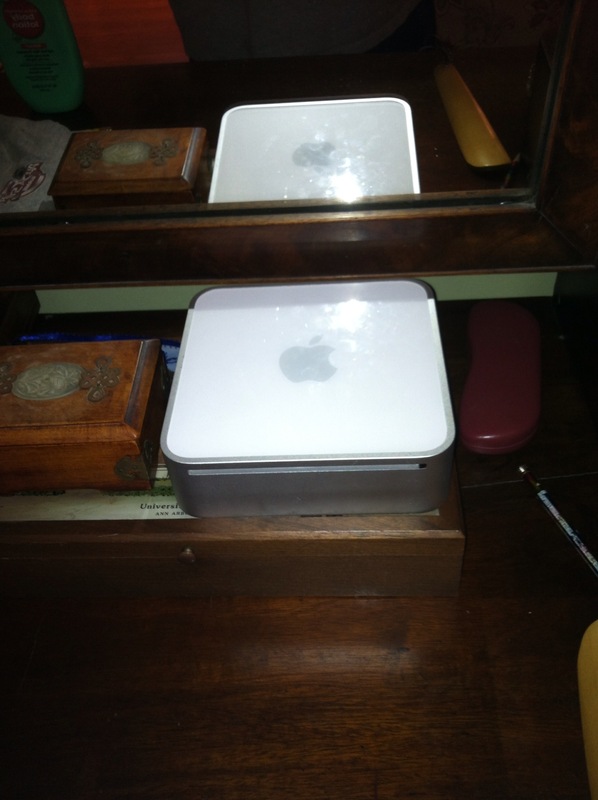 Ryan’s Mac Mini sits on my dresser, where it can’t do any more harm. I know, even before I get home. I know it has been a difficult afternoon because of phone calls, emails and texts from Veronica. Even though there isn’t much I can do to help from where I sit at work, I want her to tell me when it all goes to hell. We lean on each other when things get rough. It is how we have always operated as a couple. By the time I walk through the front door, the storm has passed. Ryan is watching NHL Network and Riley is getting ready for soccer practice. I offer greetings and head upstairs to change out of my work clothes. It is there, on my bedroom dresser, that I see the most obvious evidence of the tornado that rolled through a few hours earlier. On the dresser sits a computer. It is the Mac Mini that is normally found in the desk in Ryan’s room. The computer sits, like a brick — and every bit as functional as one. It has been completely unplugged from all its components, the mouse and monitor and keyboard and speakers, quickly and surgically removed from Ryan’s room before it could cause any more distress. We have a love/hate relationship with the computer in Ryan’s room. In truth, so does he. I know there are a million studies that suggest you should never put a computer in a child’s room. I ignored them. I figured I’m computer-savvy enough to protect my kids from the potential of online harm. I work on web sites for a living. I have loaded up their machines with parental controls. I check their browsing history regularly — just as I told them I would. The computer is in Ryan’s room because the computer has been a valuable teaching tool for him since he was very young. He learned his shapes, letters and numbers from a Sesame Street game back when he had a very limited vocabulary. He has learned to navigate the web quite well. He once asked me if there were any sites that kept track of historical NHL standings, so he could look at the standings on any particular mid season date from the last several years. I didn’t know of any. A few days later I came into his room and saw that he was happily browsing a site with that exact information — one that I didn’t know existed even though I have worked in this field — online hockey media — for more than a decade. I asked him how he had found it. He couldn’t remember. I checked the Google search box history, and found the query he had used to locate the site. I had no idea he even knew how to search Google at that point. Both my kids, like so many their age, have a natural aptitude for technology. I especially wanted to encourage this in Ryan because it can open up a whole new world to a kid who struggles socially. Plus, I envision a career for him in computers, perhaps programming or web site architecture. These are tasks that are governed by absolutes and require precise focus over extended periods of time — both a perfect fit for Ryan’s unique brain wiring. That’s the love side of the computer relationship. The hate comes in because Ryan gets too locked into repetitive tasks that become impossible for him to enjoy or break away from. He does the same things so many times that he comes to believe that he has to do them. He types NHL standings, made up from memory (except with perfectly balanced math so that they could be real). But things go wrong. The formatting gets messed up on his Word documents — and who among us hasn’t dropped a curse word when that happens — and he cannot handle it. He creates entire files and then immediately deletes them. If we so much knock on his door he immediately deletes whatever he’s working on — except that he’s not doing anything inappropriate. To some degree, these ritual behaviors regulate him, but there is such a fine line. They quickly go from regulatory to meltdown-inducing. Something goes wrong and he explodes, complains that he hates his brain and expresses anger over the wasted time and wonders why does he do this and the he curses always the cursing the loud cursing and he yells so much and so loudly we have to quickly shut the windows so the neighbors don’t think about calling the police. It happens just that fast, like a spark in a pure-oxygen environment. It is all we can do in those moments to hold him tightly and wait for the storm to pass. When it does, there is time for a conversation. We talk about limits and destructive behaviors. He usually agrees to limits, recognizing that this is not doing him any good. When outbursts happen repeatedly over a short period, the computer has to be removed from his room. Sometimes I have yanked it out in anger, but others he agrees that it must go. Usually he begins asking about its return within a half-hour. But this time, the computer has been sitting on my dresser for three days, and if he’s asking for it back, he hasn’t asked me. Computer use hasn’t been completely denied. He asks, and receives, permission to use my laptop in the living room. He looks at historical standings and box scores on NHL.com but doesn’t type anything. There have been no living room computer meltdowns. The computer will go back in his room at some point. And just as likely, it will come out again at some point. I don’t know the right answer. For now, it remains the computer on the shelf, the most expensive coaster in my house. You know I think I might have called during the event. All explained now. I do feel for you all. Once I took all the computer/video equipment to my office at work. That is the only place that was totaly controled by me. I was not going to let the lesson to be learned short changed. Boy was it ulgy for those multiple weeks. On a lighter side all the guys interview I interviewed got were really excited at first when they thought I had video games in my office. Hang in there and call for support when needed. The computer remains on the shelf, and the interesting thing is he hasn’t asked for it back. He spent much of yesterday playing on my laptop/his iPad, but he did so while in my presence and there was at least some level of engagement between us. Like anything, there’s a balance that must be struck. I can’t deny him all his favorite activities just because I would never spend my time doing them. But I also can’t allow him to do them to exclusion of everything else, and to the point that it causes problems for him.